No two landscapes are alike. From large lawn areas to a small vegetable garden, they all require completely different types of lawn irrigation watering. For this reason we need so many different and multiple irrigation system components. Another factor is a Low Cost lawn and garden sprinkler system that will save you money over the life of the irrigation system and keep your green lawn and healthy plants. 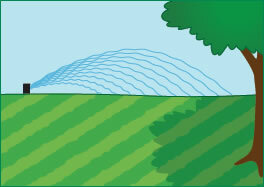 An efficient lawn irrigation / sprinkler system will conserve water use and avoid wasting excessive water. Resulting in a lower operating cost over the years. What ever landscape problems you might have Low Cost Sprinklers has a solution for you. Watering Slopes or Hills: Water can puddle or pool around lawn irrigation / sprinklers installed at the bottom of slopes or hills, causing soggy areas, which can kill grass or encourage fungus to grow. SOLUTION: Rotors with a lawn irrigation check valve stop the problem of low irrigation head drainage and eliminate puddling. Or use rotary nozzles which deliver water at a lower rate, allowing sufficient soak-in time to prevent run-off. PROBLEM: Variations in Exposure to the Sun: Over- or under-watering often results because not every part of your yard and garden requires the same amount of moisture due to exposure to the sun. SOLUTIONS: Easy-to-set controllers with multiple, independent programs allow additional watering times to be programmed for areas with more sun exposure. Lawn irrigation / sprinkler drip lines allow customization of precise water delivery to individual plants or groups of plants, based on specific watering needs and exposure to the sun.